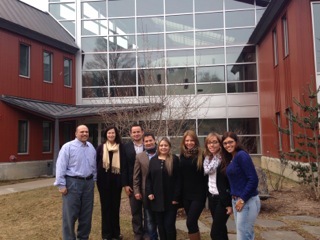 This week, the National Center for Digital Government welcomes six international visitors from Externado University in Bogotá, Colombia for a weeklong visit from April 7 to 11, 2014. This exchange is part of a broader partnership between NCDG at the University of Massachusetts and Externado University that aims to provide professors and students from both institutions with increased opportunities to study and work internationally and is being facilitated by the International Academic Program. The visit, entitled “Management Research Trends in the 21st Century”, is comprised of diverse activities at the University of Massachusetts throughout the week, including lectures, meetings with UMass faculty and students, and visiting graduate courses. The six visitors are graduate students at Externado University’s Business School in Bogotá. They are: Carlos Merchán (MBA), Magda Zea (Masters in Innovation), Diana Pérez (Masters in Human Resources and Organizational Development), María Fernanda Paz (Masters in Marketing), Héctor Méndez (Masters in Marketing), and Mariam Facio (Masters in Strategic Thinking). Elsa Augustine coordinated the visit on campus. This entry was posted in Uncategorized on April 9, 2014 by ncdg.